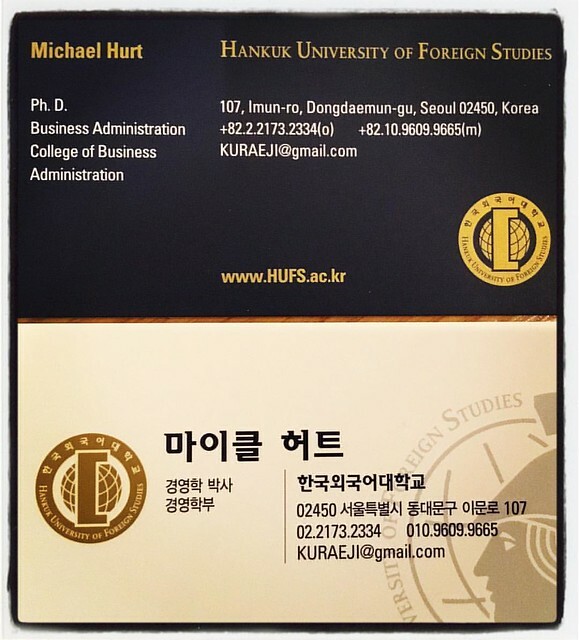 Hankuk University of Foreign Studies is a station on Line 1 of the Seoul Subway. For more details view the Explore Seoul interactive Subway map centered on this station. I'm like Jason Bourne. Here's my new, somewhat erroneous identity. I'll fix the errors later. My business card, yo. New photo added to "내사진"
New photo added to "Instagram"
New photo October 21, 2014 at 11:28PM added to "All Photos"
New photo October 12, 2014 at 10:02PM added to "All Photos"
New photo August 08, 2014 at 09:21PM added to "Camera Roll"